Special Pods: 5cm x7pcs, convey the light output of each led to the quadrangle lens, internal light dissipation is decreased, color mixing and the light output are enhanced. Mid-air parallel beam, the fixed beam angle is 4°. Spectacular graphic effects, Rotation Lens brings a new never-seen bore feature, the front lens may be rotated with “vortex”and “kaleidoscope” effects. 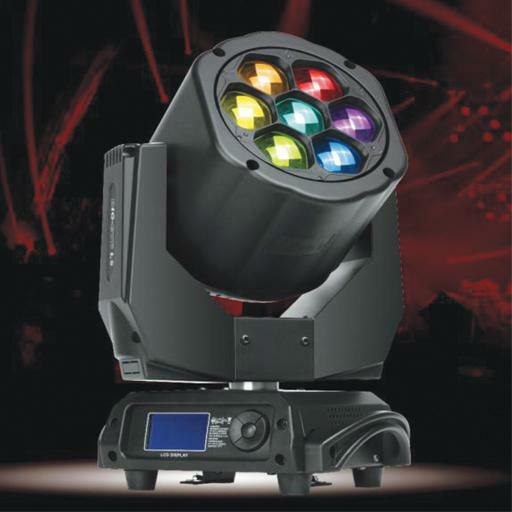 Variable Built-in Dynamic effects: Each leds can be controlled individually, shape speed,shape offset, shape fade and background select are available.